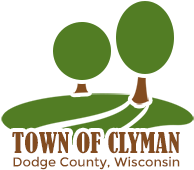 The Town Board meets the second Monday of each month at 7:30 p.m. at Town Hall, Town Hall, 735 Main Street | Clyman, WI 53016. How Can I Do a Permitted Burn? Contact the Dodge County Sheriff using the non-emergency number, 920-386-3726. Contact the Town Clerk at clerk@townofclyman.org or 920-392-9036.
Who Do I Contact for Heavy Hauling? Because Town of Clyman has Class B highways, you should notify the Town Clerk of when and where you will be hauling. Email clerk@townofclyman.org or call 920-392-9036.